By Andrew Liszewski on 04/11/11 • Leave a comment! Oh sure, the invention of the wheel was a pretty big milestone in the history of mankind, but let’s not forget that before its creation our good old legs were more than capable of getting us around. 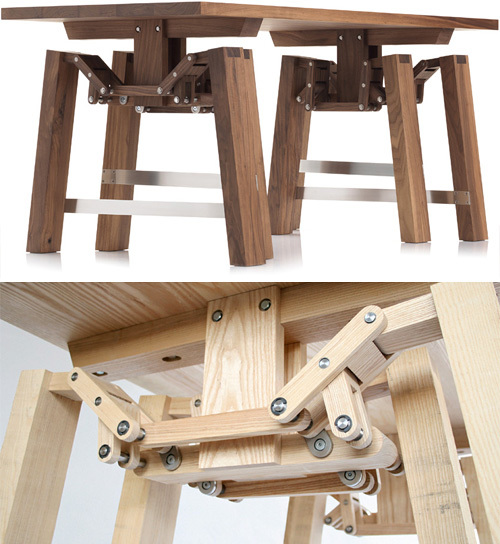 So maybe it was designed as an homage to a simpler time before man got caught up in wheel-hysteria, but I have to say I really like this walking table from Wouter Scheublin which forgoes casters in favor of a set of legs to move it around. The Walking Table is also exclusively available from Priveekollektie in a limited edition run of 8 walnut pieces, so if it’s not already sold out, you can safely assume it’s not going to be cheap.